Tired of those irritating ants ruining your pantry? We remove these potentially lethal pests safely & effectively. Can't cope with these repulsive creatures any longer? We know you want these critters out of your house! Your roof space is not a safe place for possums. Exhausted from listening to the scratching in the night? Spiders are a silent but a most unwelcome house guest. Don't panic! We're the experts in termite control & prevention. Safe & professional removal of these dangerous insects. At WR Gay Pest Control Melbourne, we understand that the removal of pests is an inconvenient but periodically necessary service. Most homes and businesses require this as a result of our building environments, modern living and our ‘Australian way of life’ that we all enjoy. The process of selecting the right pest inspection company can be a challenging one, with an oversupply of technical information and claims of immeasurable superiority and expertise complicating matters. 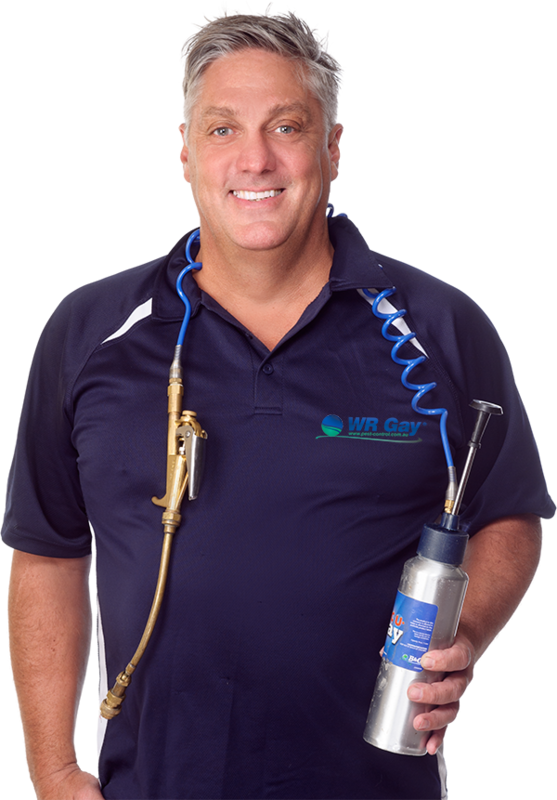 At WR Gay, we focus on providing tangible benefits to create the best pest control experience possible. Honey bees are an important part of our non-native urban ecology and our agriculture industries. They offer great enjoyment to many flourishing city or roof top amateur bee keepers and enthusiasts that now exist in Melbourne. However, honey bees as we know them are not native to Australia and the indigenous bees native to this area have long been wiped out with the introduction of the European species. Native flora species do not benefit in any way from European honey bees and are not reliant on them for pollination as is commonly believed. For honey bees to be accepted and hold a place in our urban and rural environments’ they need to be properly managed and cared for. This means by a Beekeeper in a manageable hive that can be inspected for health, disease and parasites that have the potential to decimate the bee and honey industry in Australia. When bees swarm and escape from managed hives they become “feral” and risk the entire bee and honey industry. Save the bees by keeping them disease and parasite free and don’t allow feral bees to take over your wall cavities or chimney. During the warmer months in Melbourne is when the activity of termites is the most obvious especially when the humidity increases. Termites, also sometimes known as White Ants, can cause significant damage to your property if left untreated. If you have any concerns about whether or not you could have termites it is best to have your property inspected by a professional to minimise the damage and have the most effective treatment plan and ongoing maintenance and monitoring put in place for your property. The expert technicians at WR Gay Pest Control Melbourne are highly trained and the company has over 50 years of local knowledge and experience in the termite field. For advice book an inspection with WR Gay Pest Control today. The warmer months in Melbourne provide the perfect environment for ants! Although they can seem more annoying than harmful, ants can actually present a health risk by transferring a range of germs and bacteria. As they are very commonly found in the kitchen and the pantry this presents the perfect opportunity and atmosphere for them to do just that! In many instances if these pests are left untreated they can reach numbers up to the hundreds of thousands and can also cause additional problems with their nests being made in places they shouldn’t. For treatment you can trust the experts at WR Gay with our non-hazardous product so you can rest easily knowing our home, family and pets are not at risk. Its that time of year again! The time when mice seek the comfort of our warm homes during the cooler months. Unlike rats, they won’t just keep to themselves in your roof, but often take up residence alongside you in your kitchen, dining room, or anywhere they can find food. They are incredibly nimble and quick, making it difficult to catch them, which is where the expert team at WR Gay comes in to save the day! As the weather cools down in autumn and throughout winter, rats seek solace in the warmth and security of our roofs. They are particularly prominent in the leafy suburban areas, and can be identified by the sound of scratching noises coming from within the walls or ceiling usually from dusk until dawn. The removal of these rats is very important to avoid damage to your property and is something that is most effectively handled by the experts. Call WR Gay if you think one of these critters has found a new home in your property. Although termites typically slow down a bit during the winter months, their season of activity tends to last throughout the entire year. If you think you’ve seen early signs of termite infestations, or you just want to make sure they aren’t making your property their home, book an inspection with WR Gay today. Is WR Gay Pest Control Melbourne in your area?